Hamlin passed pit road while running on fumes, then was penalized for speed too fast on his ensuing stop on Lap 64 during Stage 1; used a gas-only pit stop under green to gain track position en route to his Stage 2 victory at Lap 170 before incurring an uncontrolled tire penalty entering Stage 3. 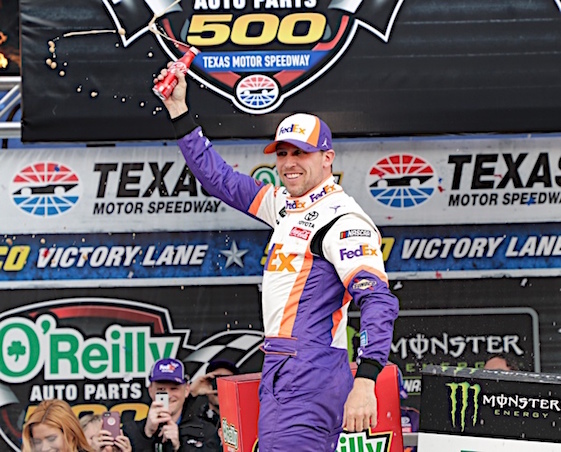 “We tried every way we could to give it away,” said Hamlin, who scored his third Cup win at TMS but first since sweeping both events in 2010. “I think you passed 327 cars, by my count,” said Gabehart, sharing the post-race dais with Hamlin and team-owner Joe Gibbs. Sunday’s race was the first around TMS’ high-banked/1.5-mile oval contested under NASCAR’s reduced horsepower/increased downforce rules package designed to promote closer racing, more passing and a better show for fans in the stands and on TV. Gabehart insisted he and Hamlin haven’t “optimized” their program after seven of 36 events. “That’s encouraging now,” Gabehart said. “You’re racing against the best teams in the world. It’s difficult to have a flawless race. It’s not an easy thing. It’s one thing to identify, it’s another to fix it. That’s something we got to work on. Bowyer’s runnerup result saved his weekend following an incident during Friday’s group qualifying session. Bowyer and his No. 14 Rush Truck Centers Ford Mustang were knocked out during the first of three sessions when he felt Ryan Newman had blocked his attempt to exit pit road for a hot lap. “We definitely ‘unclogged’ ourselves from qualifying,” Bowyer said with a laugh, referring to his post-qualifying rant. “All in all, our car handled good. It wasn’t lightning-fast all day long, but as they started slip-sliding around and struggling we’d kind of prevail on those long runs. That was our M.O. Rounding out the top-10 were JGR’s Daniel Suarez and Erik Jones, pole-sitter/seven-time Cup champion Jimmie Johnson of Hendrick Motorsports, William Byron of HMS, Aric Almirola and Kevin Harvick of SHR, Kurt Busch of Chip Ganassi Racing and Kyle Busch. The winner of Friday night’s Gander Outdoors Truck Series and Saturday’s Xfinity Series races, “Rowdy” Busch saw his bid for a third tripleheader weekend sweep sabotaged by a brush with the wall exiting Turn 2 on Lap 276 of the scheduled 334. “It just broke loose,” said Busch, a two-time Cup winner this season who led a race-high 66 laps in his No. 18 Interstate Batteries Toyota. “I kind of felt it getting a little bit freer as we were going there, and you’re still trying to hustle as hard as you can and get all you can through the corners in order to keep your lap time going…and it just busted loose on me, and I had to catch it and make sure we didn’t crash. First and foremost, we did that, and then I got back in line and got rolling and started gaining back on those guys in front of us, but the looseness was still there, and then I had to chase it on exit of (Turn) 2 one time behind the No. 10 (Almirola) and just knocked the fence down. Despite that disappointment, Busch retained his championship lead by eight points over Hamlin (310-302) heading to Bristol Motor Speedway’s half-mile bullring next weekend.